The first Lutheran church in Petrozavodskaya Sloboda was built in the beginning of XVIII century to serve religious needs of foreign experts that came to build iron mills. A wooden "German Kirk" was built at the intersection of Vytegorsky Track (now "Pravda" Street) and Kladbischenskaya Street (now Volkhovskaya Street). It had traditional bell-tower with a steeple. Around it was a "German" cemetery bordered by the wooden (later – iron) fence. In 1730 foreign experts moved away and the church begun to decay. In 1790 by the edict of Ekaterine the Great there has been formed a six-company jäger battalion from landless Finnish peasants from Viborg Gubernia. Though the battalion establishment did not suppose to have a priest, this battalion had a Lutheran priest "because of many Lutheran officers in Petrozavodsk the priest is needed not only by Finns". By that time the old Lutheran church was not used. The cemetery territory was closely surrounded by town buildings, though till the beginning of 1930s iron cast memorials still exist on the "old German cemetery". By the middle of XIX century there lived about 100 Lutherans (Finns and Germans) in Petrozavodsk. In 1858 Lutheran Parish of Olonets Gubernia was formed and from 1865 Petrozavodsk became a center of the parish. A petition with the request to build a Lutheran church in the town was presented to Olonets governor Uly Arsen'ev. The new church could not be built at the old place as new regulations demand that any "other religions buildings" could not be built closer than 103 sagenes (about 700 feet) to the nearest Orthodox church. New place for the Lutheran church was chosen at the territory of "The Governor Garden" at the corner of Drevlyanskaya (since 1902 – Gogolevskaya) Street and Angliyskaya (English) Street (now part of Engels street). The wood for construction was given for free. The new church (project by Petrozavodsk architect Mikhail Marcov) was laid in 1869 and fully finished by 1871. But Governor administration architectural department did not allow to open it till nearby territory fully organized. In July 5th 1873 a new place for Lutheran cemetery was opened – between Neglinka Orthodox and Jewish cemeteries. In August 5th 1873 the Lutheran church was consecrated at last but in 1889 it burned out due to the flue defects. In August 1st 1890 a new petition with the request to build a new church was presented and in February 1891 architectural department approved construction on almost the same project (only furnaces construction and facade decorations were changed). Once again the wood was given from government resources. In 1891 the Lutheran church was restored on the old place. A small priest house was built to the right of it. In 1893 a new Lutheran cemetery was opened – on the third mile of St-Petersburg Track (now Pervomaysky Prospect) on the high sandy hill to the left from the road. It was used till the end of 1920s. After proclamation of independence of Finland the Lutheran parish has diminished sufficiently. Repression on the believers begun. The church was working till October 1923. In March 1925 the building of the Lutheran church was transferred to the Counsel of Sport. As the new Peasant House, built to the left from the church, did not match it in style, in the summer 1927 the church building was dismantled and put together again almost in the same shape on a new place some hundred meters from the old one (new Gertsen Street). It was used as the city House of Sport. In 1940-1960 the building was used by draft office, later on – till nowadays – by different sport organizations. In 1990's the building took fire, but was restored. In 1941-1944 in Sulashgora village (now part of Petrozavodsk) there had been a Lutheran church. Later the building was used as People's House. In the July 31, 1969 a parish of Estonian Evangelical Lutheran Church was registered in Petrozavodsk. On January 22nd 1970 it bought a wooden building on the suburb of the city (Gvardeyskaya Street, 59) to be used as Prayers House. The first service was held in February 2, 1970, but it was allowed to carry christening, marriages and funeral services only from 1975. And till 1979 it was necessary to get permission for every service. In 1981 it was allowed to build a lutheran church. 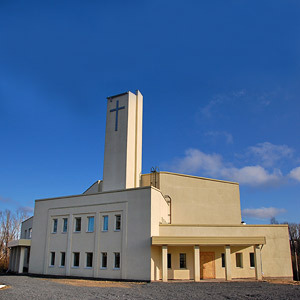 It was built to replace the existed Prayers House and consecrated in December 18, 1983 by Archbishop of Estonian Evangelical Lutheran Church Edgar Hark. In 1989 has been begun building of the Parish Hall, which consecrated in October 22, 1990 by Archbishop of Estonian Evangelical Lutheran Church Kuno Pajula. After disintegration of the Soviet Union the Lutheran parish in 1992 became a part of newly created Ingria Evangelical Lutheran Church. Later the question of building a new church was raised and a project of the new church was created. On September 11, 2004 in the park near the Lososinka river (at the corner of Krasnoarmeyskaya str. and Drevlyanskaya emb.) there took place the consecration of the place for the new church. The church project was created by the architect from Savonlinna (Finland) Keijo Tolppa. The core stone blessing ceremony was held September 4th 2005. September 6, 2009, the church was blessed by Ingria Evangelistic-lutheran Church bishop Aarre Kuukauppi.